A ready mix concrete testing is conducted to know about the features and applications of special type of concrete. Various types of tests are executed on ready mix concrete in construction site or in a cement laboratory. Several test methods are available for freshly made concrete and all tests are accomplished for hardened concrete in the laboratories. To settle the ready mix concrete quality testing on site, quality tests should be carried on. Given below, some of the most recognized ready mix concrete quality testing methods. 1. The Slump Test: Slump test is one of the most vital tests that is conducted to check the consistency and stability of freshly made concrete in a ready-mix concrete factory. So, the purpose of the slump test is to make sure that a ready-mixed concrete is usable. 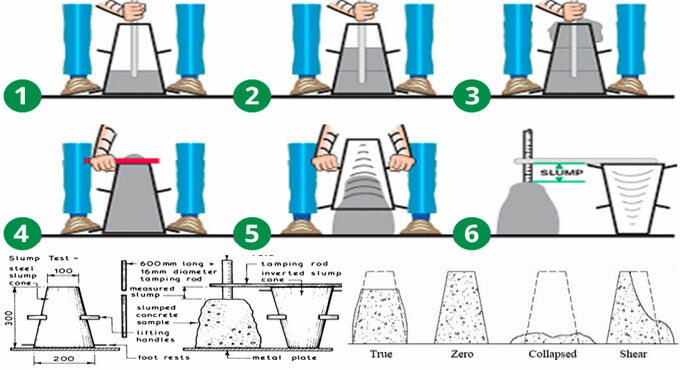 The slump test for verifying concrete quality should be carried out within a set range or from the targeted slump. Consistency is the key factor to impact the applicability of ready mix concrete. As for example, wetter mixes will be more useful and suitable as compared to drier mixes. However, ready-mixed concrete showing the similar reliability may vary in workability. It is called as the relative plasticity of genuinely formed concrete as identification of its workability. 2. The Compressive Strength: The Compressive Strength Test is carried out to examine the compressive strength of hardened concrete in concrete and cement companies. The compression strength test assesses your ready-mixed concrete strength in the solidified condition. The compressive strength test can be conducted in any laboratory off-site. The strength is provided in Megapascals (MPa) and is usually called feature strength of ready-mixed concrete at 28 days after mixing process. 3. Water Permeability: Under this test method, three cubes should be decided and tested from freshly made concrete with adherence to the German Standard DIN 1048 at 28 days age. The water permeability test should be carried out by construction experts with the purpose of assessing different concrete elements like concrete water tanks, retaining walls, foundations and so on. So, water permeability test is carried out to examine the stability as well as durability of ready-mixed concrete. 4. Rapid Chloride Ion Penetration Test: The rapid chloride Ion penetration test has similarity with water permeability test. It is conducted by the scientists to examine the consistency, stability and worth of ready mix concrete. Under this test method, three cubes are utilized as a freshly made concrete and delivered to the job site and calculated at 28 days age. This ready mix concrete test should be carried out with adherence to ASTM C1202-97. So, Rapid Chloride Ion Penetration Test facilitates the engineers, scientists and futuristic builders to maintain the workability and stability of ready-mixed concrete. 5. Water Absorption Test: This test is carried out in a laboratory and three cube samples are captured from the freshly made ready mix concrete and preserved it the curing tank for minimum 28 days. Then these cube samples are instantly delivered to the approved third party laboratory to confirm its curing and strength. The size of cube sample is equal to 150 mm and tested with adherence to BS 1881-122. 6. Initial Surface Absorption Test: Under this test method, three cube samples are applied as a fresh concrete and delivered directly on the job site. The cube samples should have been cured and placed inside the curing tank for minimum 28 days. The initial surface absorption test is carried out with regard to BS 1881-208. Consequently, it establishes the stability level of ready-mixed concrete in the scientific laboratory. This test is also conducted to check the strength of the ready mix concrete against chemical attacks, critical weather conditions, oxidation, deterioration, deprecation, wear and tear and corrosion. 7. Column Segregation: This method is conducted to work out the static consistency of a concrete mixture by calculating aggregate segregation. A column is stuffed with ready-mixed concrete and allowed to sit a moment after disposition. The column is segregated into three or four parts. Each part is eliminated individually and the concrete from that section is swamped. A non-segregating blend contains a true aggregate mass distribution in each segment. A segregating mixture contains high concentrations of aggregates in the lower segments. Consequently, column segregation method is applied to check the strength of ready-mixed concrete.